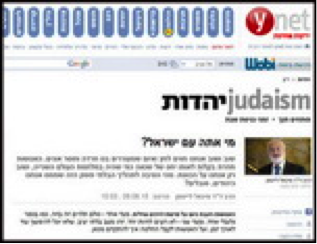 I invite you to read my article published on Ynet on the subject of the role of the people of Israel. Time and again, Jews are persecuted and terrorized. Being Jewish myself, I often ponder the purpose of this relentless agony. Some believe that the atrocities of WWII are unimaginable today. And yet, we see how easily and abruptly the state of mind preceding the Holocaust is re-emerging, and “Hitler was right” shouts are sounded all too often and all too openly. But there is hope. We can reverse this trend, and all it requires is that we become aware of the bigger picture. Humanity is at a crossroads. Globalization has made us interdependent, while people are growing increasingly hateful and alienated. This unsustainable, highly flammable situation requires making a decision about humanity’s future direction. Yet to understand how we, the Jewish people, are involved in this scenario, we need to go back to where it all began. The people of Israel emerged some 4,000 years ago in ancient Babylon. Babylon was a thriving civilization whose people felt connected and united. In the words of the Torah, “The whole earth was of one language and of one speech” (Genesis, 11:1). But as their ties grew stronger, so did their egos. They began to exploit, and finally hate one another. So while the Babylonians felt connected, their intensifying egos made them increasingly alienated from each other. Caught between a rock and a hard place, the people of Babylon began to seek out a solution to their plight. The search for a solution led to forming two conflicting views. The first, suggested by Nimrod, king of Babylon, was natural and instinctive: Dispersion. The king argued that when people are far from one another, they do not quarrel. The second solution was suggested by Abraham, then a renowned Babylonian sage. He argued that according to Nature’s law, human society is destined to become united, and therefore strove to unite the Babylonians despite, and atop their growing egos. Only today, some 4,000 years down the line, we can begin to assess whose way was right. Nimrod forced Abraham and his disciples out of Babylon, and they moved to what later became known as “the land of Israel.” They worked on unity and cohesion in accord with the tenet, “Love your neighbor as yourself,” connected above their egos, and thus discovered “the force of unity,” Nature’s hidden power. Abraham’s disciples called themselves Ysrael (Israel) after their desire to go Yashar El (straight to G-d, the Creator). That is, they wished to discover Nature’s force of unity so as to balance the ego that stood between them. Through their unity, they found themselves immersed in the force of unity, the upper, root force of reality. In addition to their discovery, Israel also learned that in the process of human development, the rest of the Babylonians—who followed Nimrod’s advice, dispersed throughout the world, and have become today’s humanity—would also have to achieve unity. That contradiction between the people of Israel, which formed through unity, and the rest of humanity, which formed as a result of separation, is felt even today. Abraham’s disciples, the people of Israel, experienced many internal struggles. But for 2,000 years their unity prevailed and was the key element that held them together. Indeed, their conflicts were meant only to intensify the love among them. However, approximately 2,000 years ago, their egos reached such intensity that they could not maintain their unity. Unfounded hatred and egotism erupted among them and inflicted exile on them. Indeed, Israel’s exile, more than it is exile from the physical land of Israel, is exile from unity. The alienation within the Israeli nation caused them to disperse among the nations. Back to the present, today humanity is in a state similar to the one the ancient Babylonians experienced: interdependence alongside alienation. Because we are completely interdependent in our global village, Nimrod’s solution of parting ways is no longer practical. Now we are required to use Abraham’s method. This is why the Jewish people, who previously implemented Abraham’s method and connected, must rekindle their unity and teach the method of connection to the whole of humanity. And unless we do it of our own accord, the nations of the world will compel us to do it, by force. After thousands of years of exerting to build a successful human society using Nimrod’s method, the nations of the world are beginning to understand that the solution to their problems is neither technological, nor economic or militaristic. Subconsciously, they feel that the solution lies in unity, that the method of connection exists in the people of Israel, and therefore recognize that they are dependent on the Jews. This makes them blame the Jews for every problem in the world, believing that the Jews possess the key to the world’s happiness. Indeed, when the Israeli nation fell from its moral apex of love of others, hatred of Israel among the nations commenced. And thus, through anti-Semitism, the nations of the world prod us to disclose the method of connection. Rav Kook, the first Chief Rabbi of Israel, pointed to that fact with his words, “Amalek, Hitler, and so forth, awaken us toward redemption” (Essays of the Raiah, Vol. 1). But the people of Israel are unaware that they are holding the key to the world’s happiness, and that the very source of anti-Semitism is that the Jews are carrying within them the method of connection, the key to happiness, the wisdom of Kabbalah, but are not revealing it to all. As the world groans under the pressure of two conflicting forces—the global force of connection, and the separating power of the ego—we are falling into the state that existed in ancient Babylon prior to its collapse. But today we cannot pull away form one another in order to calm our egos down. Our only option is to work on our connection, on our unity. We are required to add to our world the positive force that balances the negative power of our ego. The laws of Nature dictate that we will all achieve a state of unity. But there are two ways to get there: 1) a path of world suffering, wars, catastrophes, plagues, and natural disasters, or 2) a path of gradual balancing of the ego, the path that Abraham planted in his disciples. The latter is the one we suggest. It is written in The Book of Zohar, “Everything stands on love” (Portion, VaEtchanan). “Love your neighbor as yourself” is the great tenet of the Torah; it is also the essence of the change that the wisdom of Kabbalah is offering humanity. It is the obligation of the Jewish People to unite in order to share the method of Abraham with the entire human race. According to Rav Yehuda Ashlag, author of the Sulam (Ladder) commentary on The Book of Zohar, “It is upon the Israeli nation to qualify itself and all the people of the world … to develop until they take upon themselves that sublime work of the love of others, which is the ladder to the purpose of Creation.” If we accomplish this, we will find solutions to all the world’s problems including the eradication of anti-Semitism.